CyberVein is a network of immutable, blockchain-based databases on which information can be securely processed, traded, and shared. As such, the CyberVein network raises storage and processing requirements, no existing blockchain can meet. To solve this, CyberVein improves on DAG technology, introduces a novel resource-conserving consensus mechanism, and modifies the Solidity contracting language to adapt it for the processing and monetisation of vast amounts of data. DAG, or Directed Acyclic Graph Ledgers, differ from traditional blockchains in several ways. Most importantly, on a DAG ledger transactions are not grouped and verified in blocks that have to be mined. On a DAG network, nodes verify each other’s transaction on a P2P basis - every node wishing to perform a transaction is required to verify the transactions of at least two other nodes, creating an ordered sequence of linked events (hence a “Directed Graph”). First and foremost DAGs, if used correctly and for the right purposes, hold the potential of overcoming blockchain’s scalability problem. Since each transaction entails the approval of two previous ones, the network’s speed increases exponentially with its size. The lack of blocks and the mining thereof means that transactions occur “on the fly” and not in clumpy intervals, the “block-size debate” is rendered irrelevant, and the dangers of centralized hashing power are mitigated significantly. However, most importantly for CyberVein’s decentralized databases - since transactions are recorded individually as a P2P approved chain of events, not every node is required to store the network’s entire transaction history, as it is the case with PoW and PoS blockchains. This opens the possibility of “Sharding” - a type of database partitioning that separates very large databases into smaller, faster, more easily managed parts called data shards. On CyberVein, nodes are only required to store data shards relevant to their own transaction history and the smart contracts they are parties of. With this approach CyberVein is able to store entire databases as smart contracts which are permissioned to their owners and participants, without congesting the rest of the ledger. The lack of blocks and the mining thereof also means that the maintenance of consensus works differently on DAG than on traditional blockchains. Theoretically speaking, the P2P transaction verification mechanism has consensus-keeping built into it. However, in order to prevent majority attacks, most DAG ledgers implement a version of Bitcoin’s Proof-of-Work, to attach an artificial cost to the transaction verification process. This is proven to render attacks economically infeasible. Alas, PoW is an energy-costly, and otherwise useless process, which makes blockchains inefficient. CyberVein solves this by introducing a new kind of DAG-specific consensus algorithm called Proof-of-Contribution. Proof of Contribution measures the amount of disk-space a node donates to store parts of the ledger’s transaction history (or ledger “shards”), and compensates accordingly. Since disk space is a scarce resource, PoC serves as a barrier to outcompete other nodes in the verification process, making attacks costly and infeasible. In this sense, PoC uses disk space the same way PoW uses CPU\GPU resources, only that on CyberVein this resource is put to useful work, rather than wasted. Nevertheless, pre-existing DAG technology has had a dirty little secret. Most of the design proposals submitted to date are not truly decentralized and require privileged “Witness Nodes” to reduce the possibility of various attack vectors and to create an “official” order of transactions, which otherwise might be open to interpretation. These Witness Nodes have to be appointed by the network’s developers or elected by its users. These central points of control and failure are obviously a serious design flaw for a system that claims to be decentralized and resilient to political control. CyberVein solves this flaw by further utilizing the Proof-of-Contribution consensus algorithm. Instead of appointed Witness Nodes, CyberVein maintains a network of Full Nodes which volunteer to store the entire CyberVein Ledger. 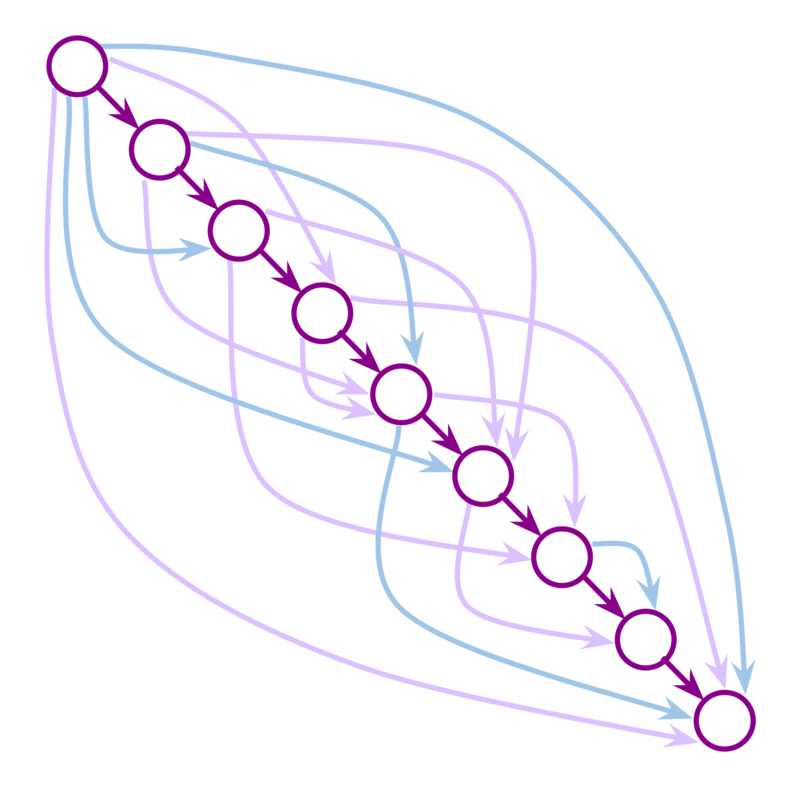 Any node on CyberVein can join the Full Node Network, however in return joining nodes are required to provide large amounts of scarce disk space. This makes it so that an attacking node would have to outcompete the storage capacities of the entire CyberVein network in order to approve or to execute a single double spending attack. CyberVein allows to maintain databases on the blockchain itself. This means that all database operations, such as the manipulation of data fields, rows, and columns, is mediated via blockchain transactions. For this to work properly, CyberVein adds data-processing specific functions to the Solidity contracting language, including functions designed to directly monetize data stored on CyberVein databases. If you're interested in learning more about CyberVein's DAG innovation and use-cases, please join us on Telegram, follow us on Twitter, and subscribe to our newsletter. Our team will be glad to answer all your questions.